With the 6-month mark quickly approaching, Rasay took some time to reflect on her accomplishments thus far and refocus on what she hopes to achieve overall in her fellowship project. Some of the highlights include actively advocating against federal approval of Medicaid waiver applications with work requirements, a policy that has unfortunately been approved in numerous states over the last six months. Rasay drafted and submitted public comment letters to the Department of Health and Human Services, explaining how work requirements can harm otherwise eligible Medicaid beneficiaries with hidden disabilities and/or substance use disorders. These letters become part of the administrative record for potential litigation that may arise to challenge the validity of these approvals. Rasay also spearheaded NCLEJ’s efforts to advocate against the Department of Homeland Security’s proposed rule to change the definition of “public charge” in immigration proceedings. Under the current rule, “public charge” is defined as an immigrant who is “likely to become primary dependent on the government for subsistence.” The proposed change will expand the definition to include any immigrant who merely “receives one or more public benefits.” Rasay drafted a 25-page comment letter arguing that the proposed changes, if finalized, would result in massive health coverage losses that disproportionately affect and discriminate against immigrants with disabilities and/or chronic health conditions like HIV, as well as immigrant families supporting children with special care needs. With a New York State Health Foundation grant, Rasay traveled to Washington, D.C. and attended the National Health Law Program’s annual Health Advocates Conference, where she participated in trainings and seminars relevant to her service project. She also networked with other social justice-oriented attorneys working toward health equity and justice. Last, but certainly not least, Rasay passed the New York State bar exam and is working to be sworn in this year! ‍In January 2018, Faber Daeufer & Itrato PC proudly introduced Jen Rasay as the recipient of the firm’s first two-year Faber Fellowship. 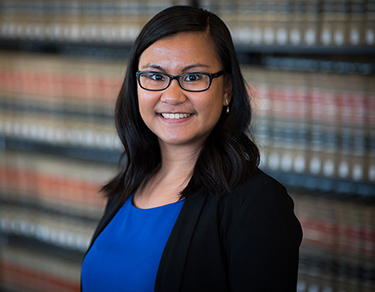 A third-year law student at Northeastern University School of Law, Rasay will be leading a new public legal service project at the National Center for Law and Economic Justice (NCLEJ) in New York City upon graduation. Through advocacy, impact litigation, and community-based organizing, she will work to challenge work requirements that effectively bar individuals with hidden disabilities to access to public benefits. Rasay’s efforts could position the organization as the nation’s foremost advocate for low-income persons with hidden disabilities. To launch the Faber Fellow Program, the firm decided to partner with Equal Justice Works (EJW). The organization creates opportunities for new lawyers seeking to dedicate their legal careers to the pursuit of equal justice for all. By administering fellowship programs funded by law firms, corporate law departments, foundations, and individual donors, EJW removes the barriers that often keep attorneys from pursuing public service careers. Having supported more than 1700 attorneys with the funding, training, and guidance to pursue their public interest dreams, EJW has established itself as the nation's largest provider of post-graduate legal fellowships. “This isn’t simply about helping large, established not-for-profit organizations fill open legal positions, and it isn’t simply about helping development offices of large, established not-for-profit organizations by providing directed giving to fund their legal departments,” said Faber. “EJW goes out and encourages the strongest law students to seriously consider careers in the not-for-profit sector. And, their model requires students to create new initiatives, find an appropriate not-for-profit organization to partner with, and then compete for funding by distinguishing the goals they believe they can achieve within a two-year period” said Faber. EJW reports they’ve seen over 80% of the fellows remain involved in public interest law after their fellowships – effectively making sure these programs have both immediate value, through achievement of the goals of the initiative pursued during the two-year fellowship, and long-lasting and growing value, by catalyzing a full career of public legal service. The road to identifying the first Faber Fellow started with almost 20 candidates identified by EJW. They each submitted a resume, recommendations, and a description of the position they created for a host not-for-profit organization. Faber received proposals seeking to address such important issues as discrimination against the LGBTQ community, assistance for victims of the opioid crisis, and contraception availability for underage women. “All 20 candidates were incredible, inspiring and would likely have meaningful positive impact on really compelling unmet legal needs,” said Faber. Rasay is extremely grateful for the opportunity this fellowship offers. She said that she often thought about applying for fellowships, but the competitiveness made her hesitant to do so. It was only after an internship last summer that she finally decided to take the leap. “I was working on employment discrimination cases and a partner there was a former fellow. She told me that she thought I should go for a fellowship and offered me a letter of recommendation. I really started thinking seriously about applying and asked one of my professors to help me brainstorm.” Though Rasay still felt that she was late to the process, she said that her professor’s encouragement was the motivation she needed to apply. Rasay said that her personal experiences also contributed to her interest in this area of public service. “I come from a low-income background and my parents took on multiple low-income jobs to care for their children. I connect with these people and I know that this is a vulnerable community.” She also considered the circumstances of her aunt, who has suffered from a hidden disability for years. “I kept thinking about her and the gravity of the situation. I ultimately hope to stop these Medicaid work requirements, but if it does happen, I want to make sure there’s a safety net to minimize the effects as much as possible.” For Rasay, this fellowship allows her to combine the three types of legal issues she feels most passionate about – discrimination, healthcare and public benefits law.